Gathering the resin of the trees that we distill is a natural. 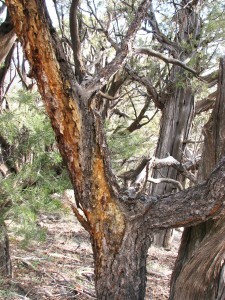 Tree resins have been and are used cross culturally for many purposes from creating healing salves and balms to literally sealing wooden ships. Not to mention the incense burners billowing in temples across the world. 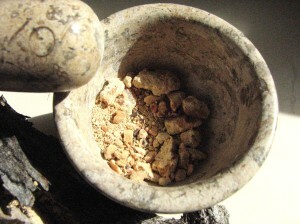 In my personal quest to find sacred resins such as Frankincense or Copal here in the southwestern United States where I live, I have made a simple discovery. 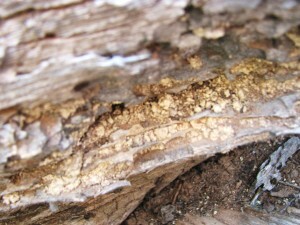 A couple years ago on a morning walk with my dogs on the “bench” (little mesa) out the back door, I noticed a subtle line of glitter on the grey and weathered trunk of a fallen Pinion Pine. This tree had obviously been down for many years and had been taken apart by weather and decomposition. Putting a small granule of the glittering substance on my tongue, I realized I was tasting very old resin. The taste distinctly reminded me of the incense sensors billowing smoke of Frankincense and Myrrh from far away days of my youth in the Catholic church. A very deep memory. On those daily walks, I began taking a pair of tweezers and a small jar to gently pluck the fragile granules from the exposed veins of resin. With such small quantities and time consumption to gather, I thought “Well, this is something special, but how can I possibly include it in my work?” Thinking about the solvent properties of the essential oil, it then clearly occurred to me to infuse the resin into the essential oil of its living tree. 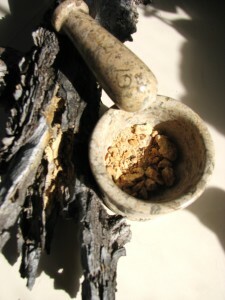 This is the birth of “Future Amber” essential oil. To me personally, the aromatic is quite similar to Pinion Pine. The responses from people (end users and “big noses”) have been quite surprising with one well known perfumer insisting on 4 ounces at first whiff. People are quite drawn to it, more so than our most popular Pinion Pine. 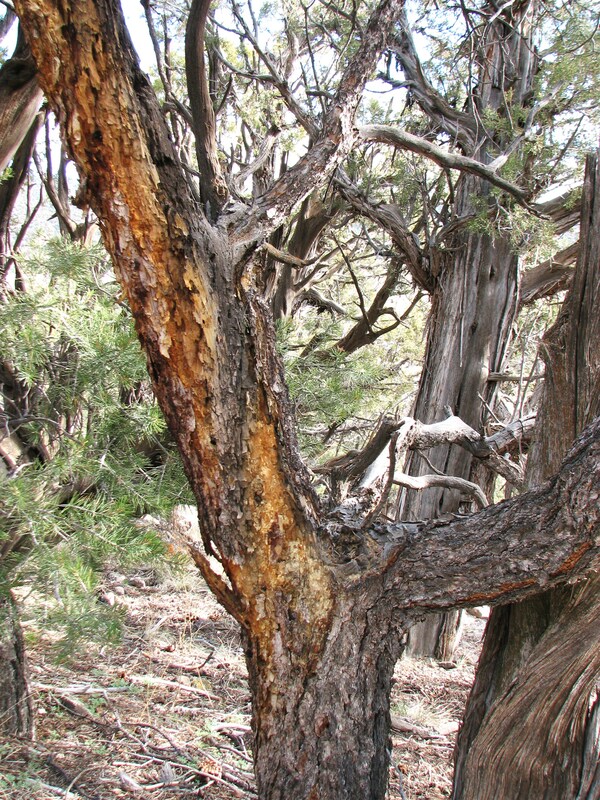 Based on traditional uses of Pine resins being used to draw infections, splinters/thorns/stingers etc., I should think this essential oil infusion would lend itself to these type of applications, physically or energetically. Also as a facilitator to journey to days gone by or days to come through the physicality of the old, weathered resin being electro-magnetically active in the essential oil. Not to mention using for plain old smelling good. 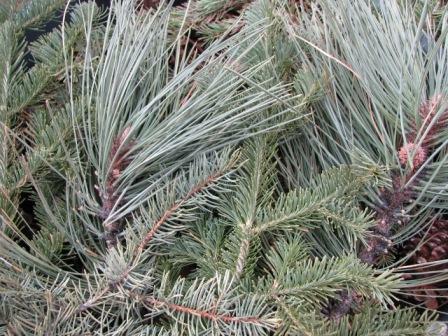 Conifers for Winter Wellness PLUS++++!!!! Besides being helpful for colds, flu’s and allergies, thereare chemical compounds in Conifers that may help with muscle trauma or over work. 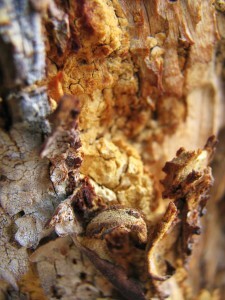 Relief and healing for arthritic and rheumatic conditions is another of the indications for these broad ranging trees. Second rule of herbalism? The medicine you need is always at an arms reach. Well, the first rule of herbalism is FOOD IS YOUR MEDICINE! Pay attention to what you are putting in your precious elemental vessel and how those inputs make you feel! 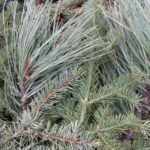 Conifers are high in chemical compounds known as “monoterpines” (as is Citrus – can you smell the connection? ), which have been known to be anti-cancerous . And in the end, they just plain smell good. Open that bottle up, and time from your childhood may come to you. May 9 2014 – first to send an e-mail “Mountain Trinity” in subject line to info@houseofaromatics.com with their mailing address will receive a dram of Mountain Trinity essential oil. You may feel a sense of calm and peace as though you were in the forest. Indeed, through the electro-magnetics of the trees atomic structure, the forest that the trees were gathered from for distillation, actually comes to you. Relax and enjoy your self. Life moves fast. Smell good. *Phytochemistry – the wide variety of chemical compounds made by plants.